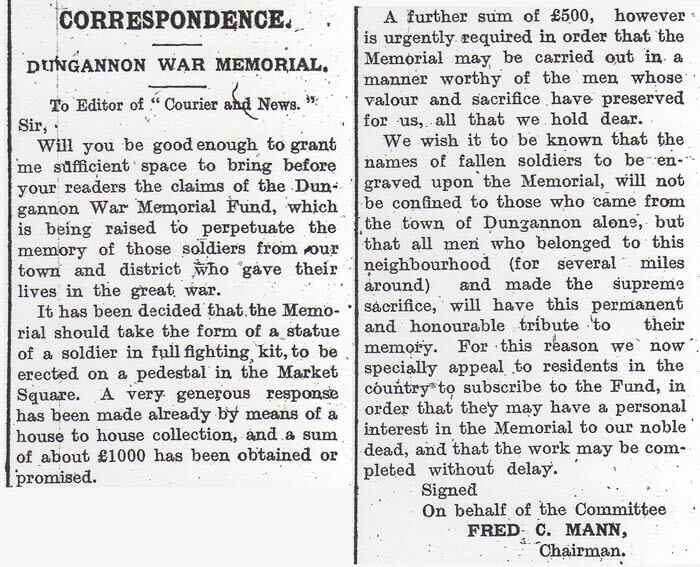 Sir, Will you good enough to grant me sufficient space to bring before your readers the claims of the Dungannon War Memorial Fund, which is being raised to perpetuate the memory of these soldiers from our town and district who gave their lives in the Great War. It has been decided that the Memorial should take the form of a statue of a soldier in full fighting kit, to be erected on a pedestal in the Market Square. A very generous response has been made already by means of a house to house collection, and a sum of about �1000 has been obtained or promised. A further sum of �500, however is urgently required in order that the Memorial may be carried out in a manner worthy of the men whose valour and sacrifice have preserved for us, all that we hold dear. We wish it to be known that the names of fallen soldiers to be engraved upon the Memorial, will not be confined to those who came from the town of Dungannon alone, but all men who belonged to this neighbourhood (for several miles around) and made the supreme sacrifice, will have this permanent and honourable tribute to their memory. For this reason we now specially appeal to residents in the country to subscribe to the Fund, in order that they may have a personal interest in the Memorial to our noble dead, and that the work may be completed without delay. Signed on behalf of the committee. Fred C Mann. Chairman. 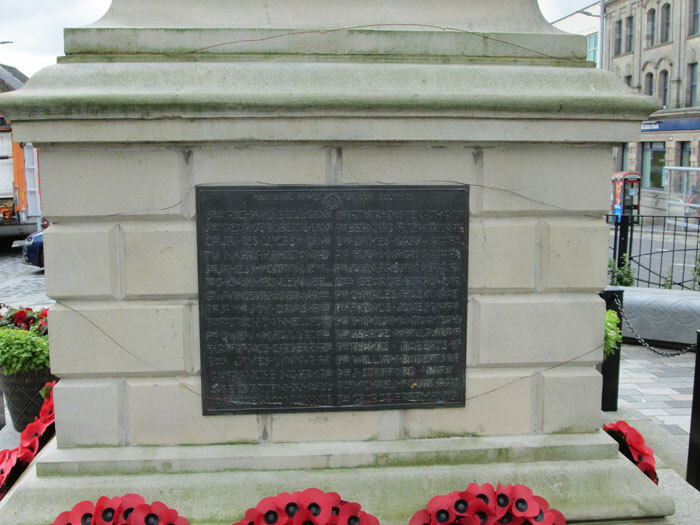 It has been arranged to unveil Dungannon War Memorial on Armistice Day (11 November) and the Urban Council have decided to request the business people to close their premises from 10 o�clock to 12 o�clock that day. 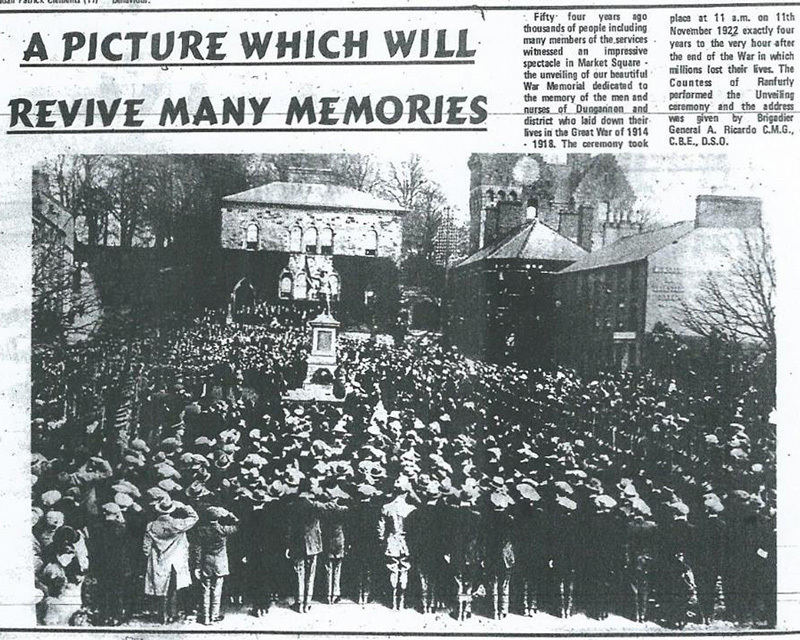 Dungannon and District War Memorial is in the course of erection in Market Square, and the unveiling ceremony is to take place on Armistice Day, 11 November, by the Countess of Ranfurly. The ceremony will commence at 10.30 am, when the names of the fallen, which are inscribed on the monument, will be read. Then will follow an address by Brigadier General Ricardo, C.M.G., D.S.O. 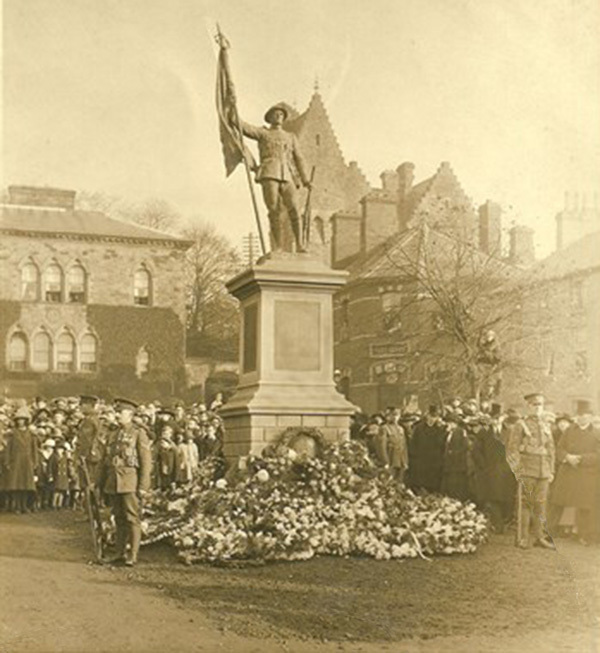 At 9.45am sharp, all ex-service men in the town and district wearing their medals, are requested to parade at Northland Row, and afterwards march in procession to the Square under the command of Major Robert Stevenson. A detachment of military with band, and also the Royal Ulster Constabulary under Co. Inspector Regan and Colonel J K McClintock, C.B.E., will take part. After the unveiling at 11 o�clock a solemn two minutes silence will be observed and the Last Post and Reveille having been sounded, a space will be kept clear around the memorial so that all those who wish may lay wreaths or other floral emblems on the steps of the pedestal. It is requested that all business establishments in the town will close during the ceremony on the 11th November. 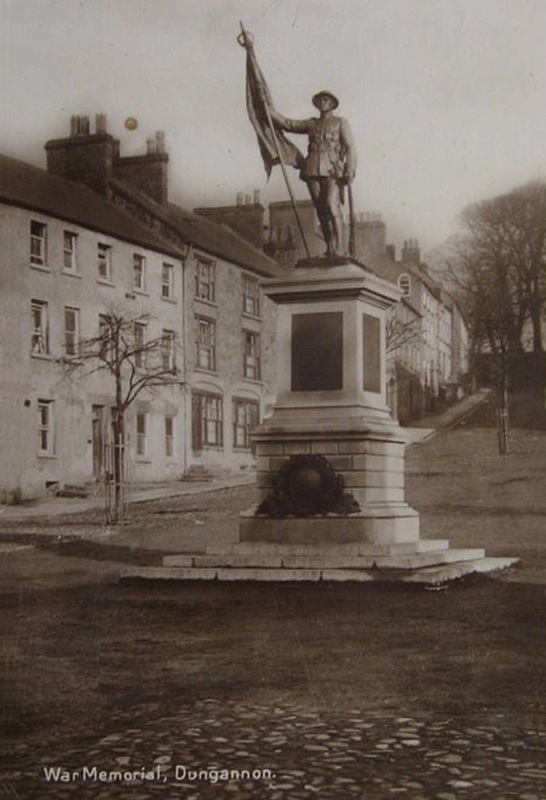 DUNGANNON WAR MEMORIAL. Impressive Unveiling Ceremony. List of those Remembered. Great number of floral tributes. When the call to arms sounded during the early stages of the Great War, the men of Dungannon and district nobly responded. They went forth in hundreds to fight for King and country and many never returned. 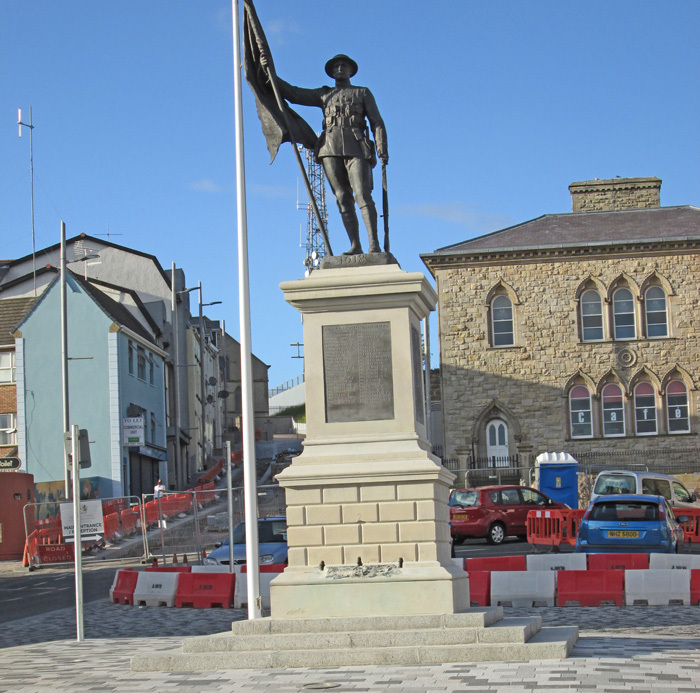 That their sacrifice should not be forgotten is only right and there stands in Market Square a Memorial as a fitting tribute to the memory of the gallant heroes, and it was unveiled on Saturday last. The occasion was the fourth celebration of that memorable Armistice Day, 11 November 1918. This beautiful memorial has been erected at a cost of 1700 pounds and is the work of Mr F W Pomeroy, R.A., London. A bronze figure of a soldier representing victory standing about 8 ft. 6 ins. 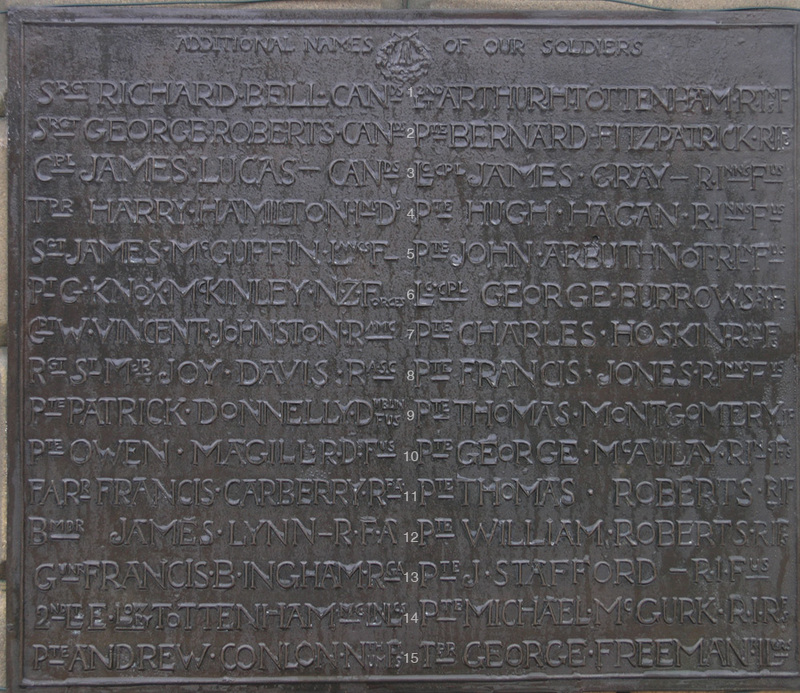 in height is mounted on a large pedestal of Stancliffe stone on which are four bronze panels containing the names of the fallen. On two of the panels are the names of men who served in the Royal Inniskilling fusiliers. The total height of the monument is 18 ft 6 ins. and it weighs about thirty tons. Dr F C Mann, Chairman of the Memorial committee and Mr W McGuffin, secretary, are deserving of a large share of the credit in connection with the erection of the memorial. They spared neither time nor trouble in bringing the matter to a successful issue, but their efforts would have been in vain had it not been for a generous public who subscribed the large sum necessary. 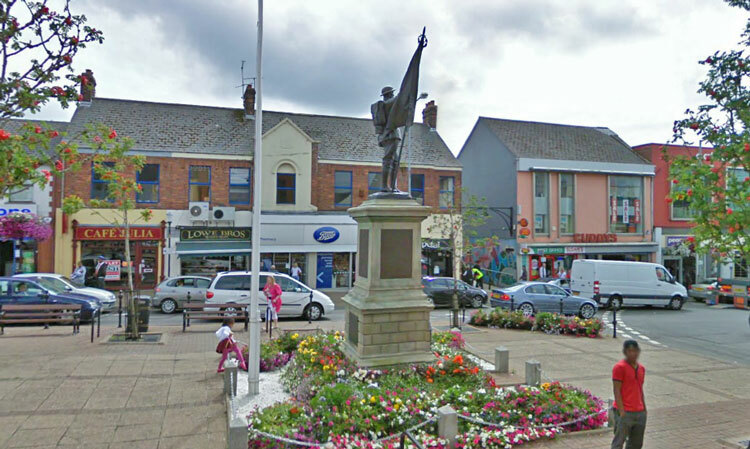 It is a creditable achievement for Dungannon, when other neighbouring towns such as Omagh, Armagh, Cookstown or Portadown have not yet erected a public memorial. The scene at the unveiling ceremony was solemn and impressive and all the details were carried through with precision. At 9.45am about fifty picked men of the Royal Ulster Constabulary in county Tyrone under County Inspector Regan, and Captain Walshe, District Inspector, Dungannon, and fifty members of �A� Special Constabulary under Co. Commandant Col. McClintock and Captain Maynard, Dungannon, formed up at Northland Terrace. Here also 200 ex-servicemen paraded in charge of Major Robert Stevenson and Major T C H Dickson, M.C., All marched to the Square headed by a detachment of the Warwickshire Regiment from Armagh with band. Lieutenant Colonel Yatman officer commanding the troops at Omagh and Staff Major C A M Alexander, M.C., representing the royal Inniskilling Fusiliers were present together with four men of that regiment who occupied positions at each corner of the memorial. In a space at the rear of the memorial, the local troops of Boy Scouts were drawn up in command of Scout Master Robert Howard, and nearby were the Girl Guides in charge of Miss E Wilson, while behind were places some hundreds of school children with their teachers from the schools of the town and surrounding districts. In addition to the Earl and Countess of Ranfurly, Lady Constance Milnes Gaskell was present. In front of the memorial, a space was reserved for the relatives of the fallen and behind them were the ex-service men. Royal Irish Fusiliers, Private Robert Morrow V.C. Brigadier General Ricardo, C.M.G., D.S.O., then addressed the assembly and said the committee have honoured me greatly by asking me to take part in this ceremony of Remembrance today. Many of those who we are assembled here to honour were my comrades, and on many occasions spread over more than a quarter of a century I have learnt to value the sterling qualities of Tyrone soldiers. I understand that this Memorial has been erected by united efforts of all creeds and classes in honoured memory of three Nurses and 190 Dungannon men, who gave their lives in the Great War. What is the sentiment that prompted those who took charge of this project? I think three words sum it up � Lest we forget. To you, the names of those loved ones are inscribed on this Memorial, there is no need of a reminder, and they are never forgotten. We offer you our tender sympathy and we trust that in this day of sweet remembrance, you may take comfort in the thought that their memory is held in the highest honour by all. Their devotion to duty has set us a great example and a noble inspiration for the generations to come. Those whom we remember today would have liked to be honoured in this, the centre of their native town, of which they were so proud, and to which their thoughts so often turned in pride and affectionate remembrance. I shall never forget to the end of my days the replies I received from the parents of those, whose death it was my sad duty to announce to them by letter. The courage and the pride which was always mingled with their sorrow helped me to understand where the Tyrone men got that grit and courage from which I have so often witnessed. There is a very beautiful custom in France, where so many of your dear men now lie, which I often think might be adopted in our own country on Armistice Day. On 1st November, All Saints Day, the school children in every town and village march to their War Memorial with bouquets of flowers, the whole population rich and poor is present and the Mayor of the village delivers an address in honour of those �Children of France�, as the French soldier who has fallen in battle is always called; and then all proceed to the local cemetery and every grave is decorated with the school children�s flowers, none are missed out. Mr Barrie truly says:- �God gave us memory, that we might have roses in December�. To those who by the mercy of God have returned, this Memorial also says ��Lest We Forget�. 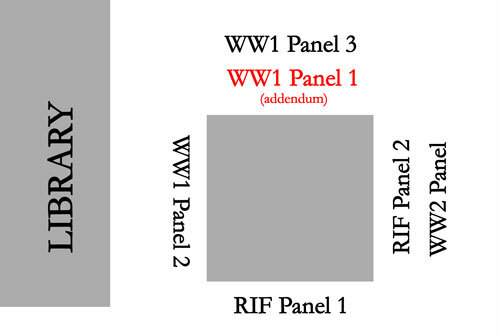 In 1914 we were all ignorant of what war, modern war really was. We have learnt it now. We are, or should be, wiser men. We can never be quite the same. We thought we knew each other as friends or neighbours, but we did not realise what a font of nobility, unselfishness and loving kindness there was in each one as a comrade. It had always been there but the stern test of modern war brought it to the surface. We learnt, did we not, what that word comrade really means. We expected from each other modestness, manliness, cheerfulness, unselfishness, and we were very seldom disappointed. We learnt that discipline and a strong sense of duty are the first essentials for an efficient soldier, whatever his rank. Are not those virtues just as necessary to make us efficient citizens, now we have returned to civilian life? Let the comradeship of the trenches, where we knew no division of creed or class, be with us to the end. Let this Memorial remind on and all of our duty to help our ex-servicemen, especially those who are scarred or maimed in mind or body. Many today are unemployed and I would specially plead on their behalf. �Lest We Forget�. They too suffered for the honour of Dungannon. And lastly, this is Armistice Day, the fourth anniversary of the end of the most hideous war ever fought. �Lest We Forget�. Let this Memorial remind us all of what war meant. Four years of war, waste, destruction and suffering, then as the result of that war, four more years of strife and want, unrest and disappointment. Four long years of adversity and anxiety, which seemed as if they would never end, Then the Armistice and the longing for settlement, for security, for a just and lasting end to strife, for reconciliation, co-operation and recovery. Today as we look around this world of ours, both far and near, North, south, East and West, are we not perilously near the tragedy of disillusionment? We are learning that it is easier to shatter and pull down than it is to build up, and it must be plain to us that the difficulties of achieving peace will be even greater than the problems of the war and will last far longer. War may be forced on a nation or a community. A people must fight, if they are firmly convinced it is an absolute necessity but they should not until every other expedient has been fairly tried. If such a call of duty comes to Dungannon again, which God forbid, we know it will be obeyed as freely as it was in 1914. But surely those four years of war and the last four years of so-called peace must have thought every thinking man and woman that violence may win victory for the moment, but does not bring peace. Force may be and is often necessary, but force by itself cannot achieve that peace and goodwill which will endure, and which are our ideals as Christians. Force and strife must end sometime and what then? What can we do to face the difficulties around us? Let the example of those whom we honour today give us the answer. Again quoting Mr Barrie, �Before all we need courage, and again courage, that lovely virtue�. We must never lose courage, for if that goes, all goes. Physical courage is a very great virtue, but I venture to say that greater still is the courage to think and do what we believe to be right. I will now ask the gracious lady, the Countess of Ranfurly, whom all Dungannon knows and loves so well, to unveil this beautiful memorial. 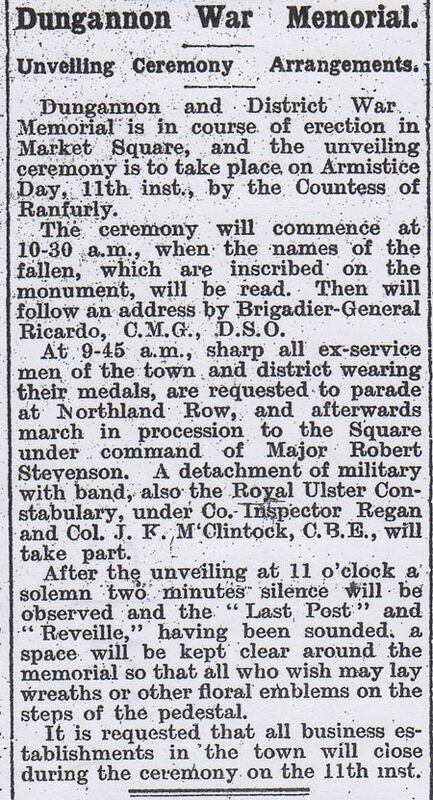 Who could be better fitted to perform this ceremony in honour and affection of those sons and daughters of Ulster, from Dungannon, who laid down their lives in the Great War? The Countess of Ranfurly then unveiled the memorial. As she did so, the soldiers and police presented arms, and eight buglers of the Royal Warwicks sounded the Last Post. Thereafter the vast assembly remained in an attitude of respectful silence. The impressive stillness was then broken by the sharp notes of the Reveille, after which the numerous wreaths were deposited at the foot of the memorial. Amongst the relatives of the fallen present at the unveiling ceremony were Mrs Morrow, mother of Private Robert Morrow, V.C. ; Mr James Lynn, whose four sons were killed; and Mr James Williams, and old Crimean campaigner. -	Mr Robert Leith, J.P. The wreath from Lodge 9 (Lodge of the Muses) was placed in position by P.G.M W H Darragh, J.P., and V W J Smith. From Mrs Bingham, Royal School, in memory of her son. From the relatives of Sergeant William Arthur Roulston D.C.M.